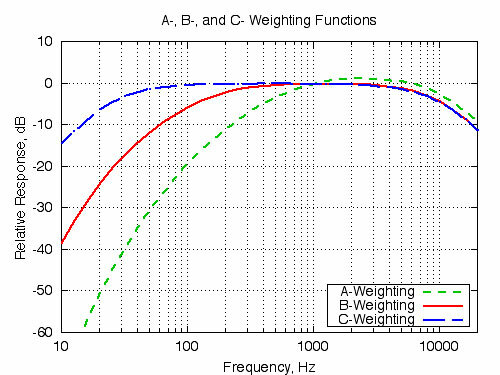 What are Frequency Weighted Filters such as A, C and Z Weighting? What are Frequency Weighted Filters and why are they used? These refer to a special filter that adjusts the spectral component of a signal according to the specified function and intended use of the readings being taken. These Frequency Weightings were created to more accurately represent the noise readings for different applications. For example, the ear is relatively insensitive to very low and very high frequencies, but more sensitive to frequencies between 2000 and 5000 Hz. For that reason, by international agreement and in accordance with IEC 61672:2003, all sound level meters now have A, C and Z weighted frequency filters. The A Weighted Frequency Filter is designed to best express the response by the human ear and is subsequently the most commonly used frequency response. It was originally developed to adjust the signal frequency spectrum to match the sensitivity of the human ear for sound pressure levels below 50dB. The use of the A weighted frequency curve is mandatory for measurement of environmental and industrial noise as well as assessing potential hearing damage and health effects of noise. The C Weighted Frequency Filter attenuates progressively at the upper and lower ends of the audible frequency range, however the attenuation of the signal at low frequencies is much greater than with the A Weighting Filter. The C Weighted Filter is used to ascertain the acoustic emissions of machines, as well as being used for Peak measurements for Noise at Work Assessments. Although the C weighting frequency response is less commonly used, all Class 1 sound level meters are required to have the C Weighted Filter. The Z Weighted Frequency Filter, previously known as the Liner or Flat Weighted Filter, has a very flat frequency response and only adjusts the signal frequency spectrum below approximately 10Hz and above approximately 20kHz, and gives a flattened response to the remaining frequencies. Z Weighted Frequency Filter is often used in conjunction with octave band filters, a typical linear response would be flat from 10Hz to 20KHz. This Frequency Weighting was originally intended to adjust the signal frequency spectrum to match the sensitivity of an average human ear for sound pressure levels between approximately 50 and 90dB. It attenuates progressively at the upper and lower ends of the audible frequency range, however the attenuation of the signal is less than with A Weighting. This Frequency Weighting is not commonly used. This frequency weighting is also designed to adjust the signal frequency spectrum to match the sensitivity of an average human ear for levels between 50 and 90dB. D Weighting is similar to B Weighting but it’s improved upon by including an allowance for ear canal resonance at frequencies between 2kHz and 5kHz. D Weighted Frequency Filter is generally used for high level measurements of aircraft noise.